The princess of the Sol Dimension has arrived! 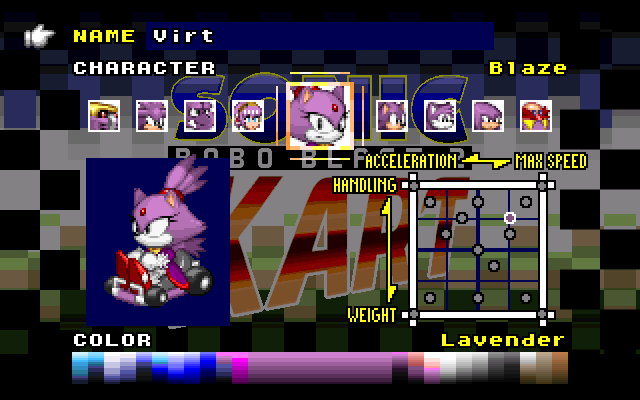 Her stats are fairly similar to Sonic's, but she should handle a little better. If you like fiery hot races, then this addon is What U Need! WE GOTTA GET EVERYONE HERE! ¡¡¡MARIO, LUIGI, 2.0SONIC, EARLY SONIC, XTREME SONIC, EVEN SPONGE BOB!!! Sorry, i was hyped to see these next-gen Blaze sprites. The shoes look a little off to me, but you got the style down pat. Good job. Her shoes are usually a kind of pinkish color, does that even exist on the SRB2 palette? The sprites are melting my eyes from the beauty. How do you people get these done when Kart's been out a few days? Ezehot I agree oh and these sprites are cool. Highpoly MD2s for kart anyone?